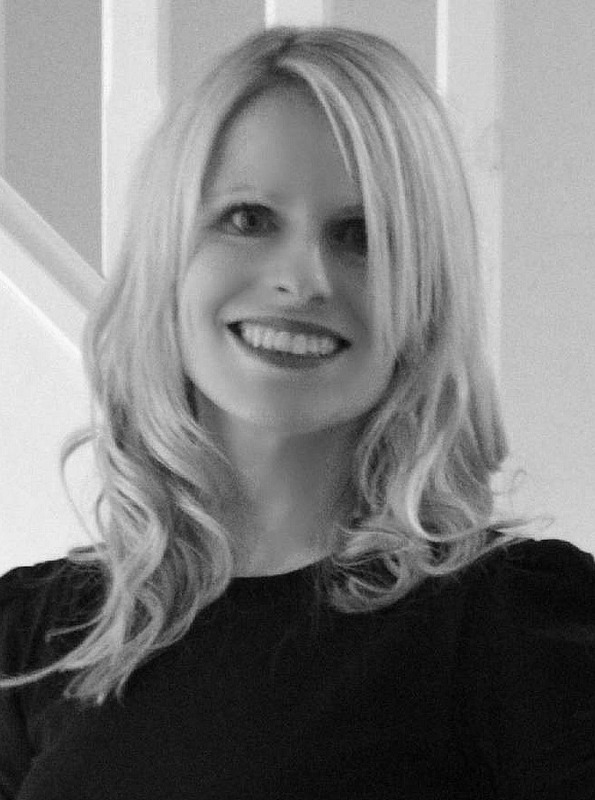 Apart from a rather unfortunate encounter with a bottle of red hair dye in my late teens (my hair was a gorgeous vibrant red for two washes and then a horrible light orange hue for months), I have always been blonde. These days my natural colour is definitely at the mousy end of the spectrum, thus requiring a helping hand from either the sun (unfortunately rarely seen on these shores) or a tinfoil wielding hairdresser to restore it to the shade of blonde I was blessed with as a child. At the moment my tresses are in dire need of some TLC. I’m almost ashamed to admit it, but I haven’t visited a hairdresser since the end of July (before we went on our summer holiday..) and three months between haircuts is far too long. Part of the reason why I haven’t made that call and booked an appointment is that I just find it such a bore. I’m fine for the first hour or so, having a cup of coffee and reading magazines, but I resent having to give up the two or three hours it takes to have a full head of highlights, cut and blow dry. But today when an email offering 50% off all colour treatments landed in my inbox, I finally took the plunge and booked an appointment for Friday. I had been toying with the idea of going slightly darker but I think I’m going to stick with my regular colour. Length-wise I’m afraid there’s nothing much to get excited about either as I like my hair to be at least shoulder length so I can tie it up and wear it wavy or straight. 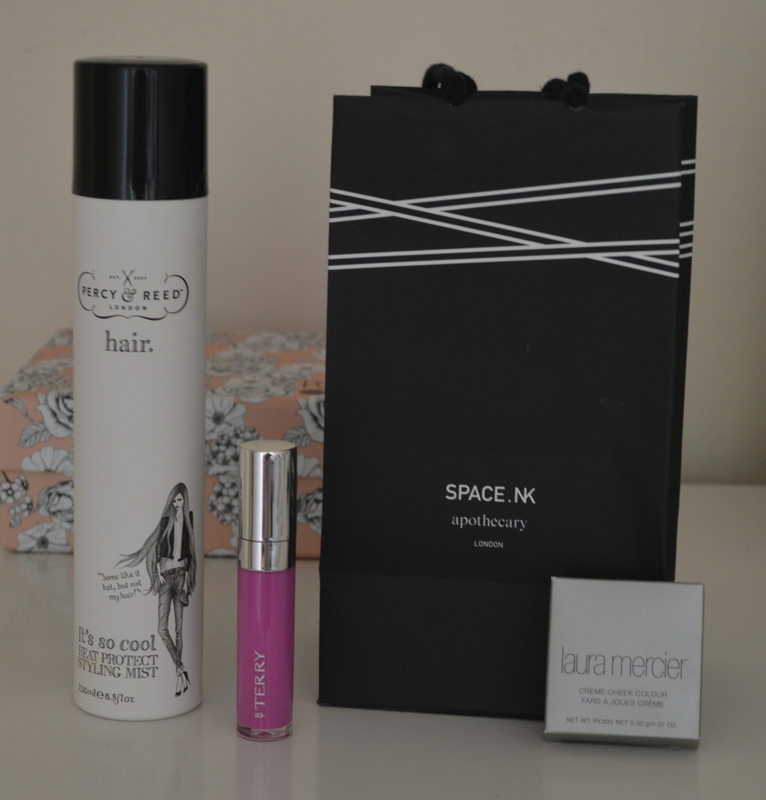 Space NK is like a candy store for grown ups, full of expensive but oh-so-tempting treats. I don’t think I’ve ever gone into one of their shops and come out empty-handed, even if I wasn’t intending to buy anything. I don’t wear that much makeup and I would rather spend a bit more on a few choice products than clutter up my makeup bag with items I don’t need. That’s not to say that I don’t rate budget beauty brands – I love online beauty retailer E.l.f for instance, where you can pick up a new lipstick or eye shadow for a couple of pounds. My number one desert island product that I don’t leave the house without is lipstick or gloss. In fact I would probably forgo mascara if it meant leaving my lips bare. In winter I like strong plums and reds but in summer it’s nice to keep things a bit lighter, especially when you’ve got a tan (fake or real). I’ve been searching for ages for the perfect lipgloss – not too pale and with a blue undertone rather than gold or brown. This week I found it, while out on a shopping trip with a couple of girlfriends. The Laque de Rose in Rose Romance from By Terry looks almost neon bright in the bottle but is the perfect skin-flattering shade of pink on the lips with just the right amount of shimmer. 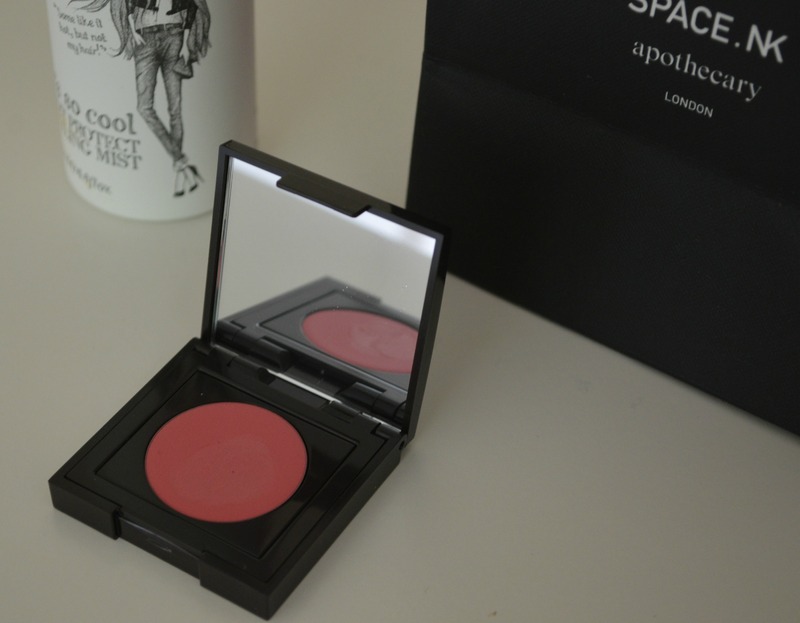 I also bought a new cream blusher from Laura Mercier in Rosebud, a suit-all pink that again is perfect for summer, and a heat protecting styling spray by Percy & Reed. The latter is essential for a Ghd addict like myself and will hopefully stop my hair from becoming straw-like due to the constant straightening and curling I put it through. 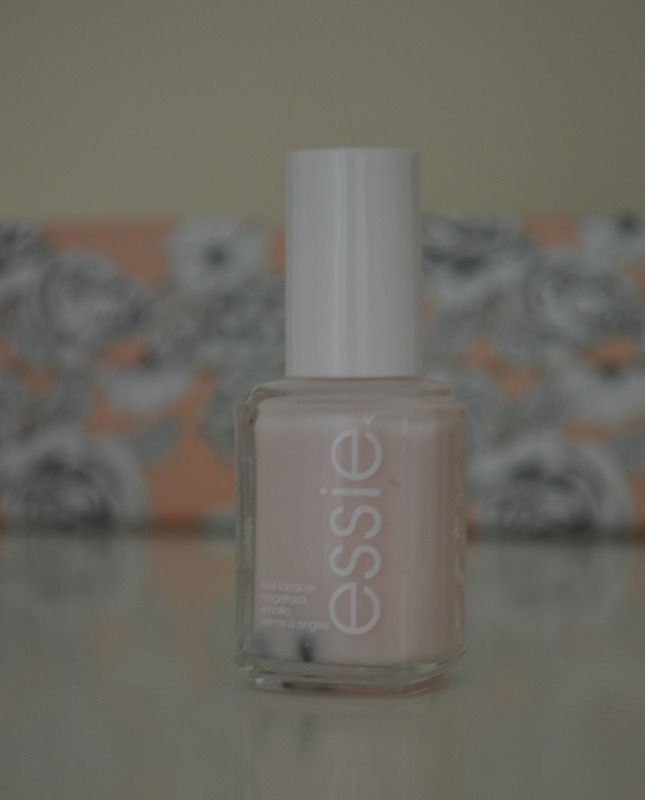 Finally, I popped into Boots to grab a bottle of Essie nailpolish in Ballet Slippers, my go-to polish for a glam yet understated manicure. Why, oh why, do all beauty products run out at the same time and with a week to go until payday? Luckily I had some points saved up on my Boots advantage card so I was able to stock up and replenish my bathroom cabinet shelves without too much damage to the bank balance. 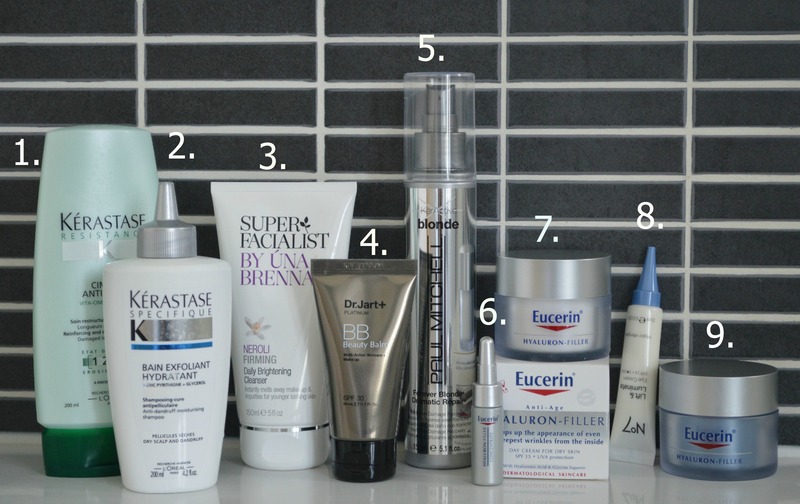 There is always the temptation to buy cheaper substitutes to see you through until the end of the month but, while there are some great budget beauty buys out there, I’ve learned the hard way that it doesn’t pay to scrimp on the products you really love. 1.Kérastase Resistance Ciment Anti-usure conditioner. 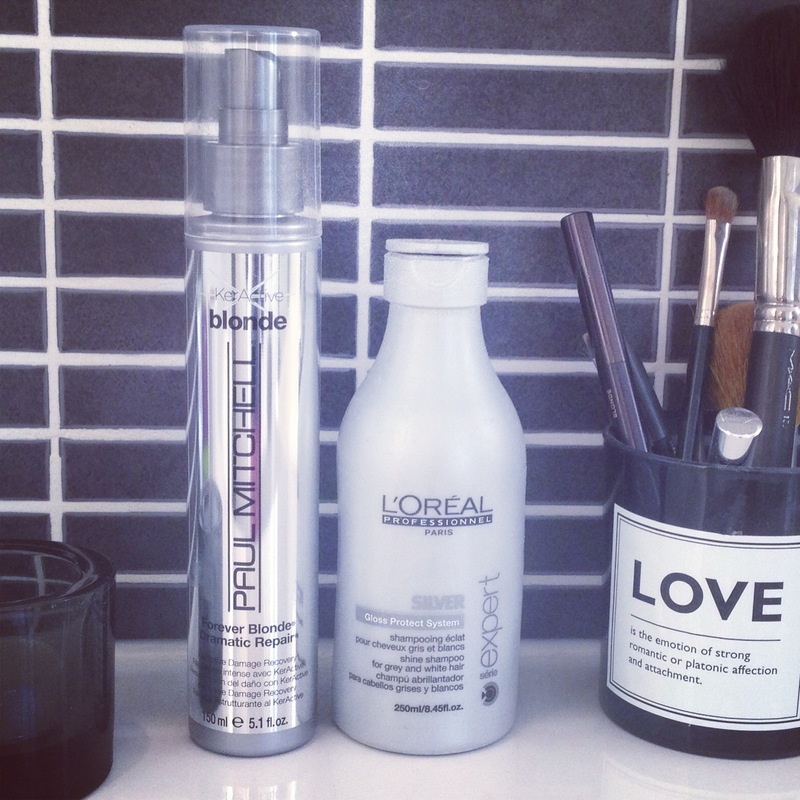 A nourishing treatment conditioner that’s perfect for dry, highlighted hair like mine. 2. Kérastase Specifique Bain Exfoliant Hydratant shampoo. I have a very dry scalp and my hairdresser recommended this shampoo which has really helped. 3. Super Facialist Neroli Firming Daily Brightening Cleanser by Una Brennan . This cleanser is great value and lives up to its name, making skin look brighter and refreshes. 4. Dr Jart+ Platinum BB Beauty Balm. I was very late to jump on the BB bandwagon but after trying this cream I am definitely a convert. With great coverage and texture, it is easy to apply, lasts all day and has a 30 SPF. 5. Paul Mitchell Forever Blonde Dramatic Repair. 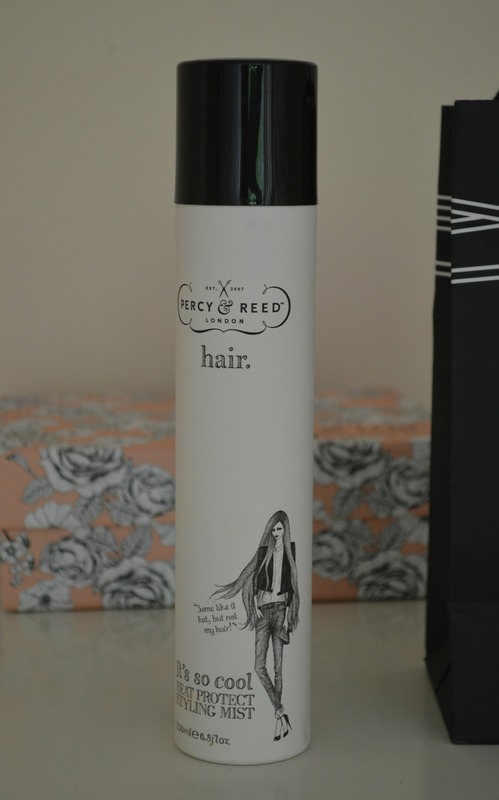 Again, this leave-in spray was recommended by my hairdresser and has quickly become a regular fixture in my haircare line-up. 6, 7 and 9. I swear by the day and night Hyaluron Filler creams by Eucerin, the products make a real difference to my skin and don’t break the bank. As an extra bonus, this time a small bottle of serum was included with the night cream. 8. No 7 Lift & Luminate Eye Cream. I only recently started using an eye cream so I can’t say that this one is a firm favourite yet but my initial impression is good. It has a light texture and sinks into the skin quickly.